The Piper PA-31T2 Cheyenne IIXL is a six-seat all-metal low-wing twin-engine business aircraft. The Piper Aircraft Corporation developed the PA-31 Navajo in the early 1960s. The first prototype PA-31 flew first on 30 September 1964. The production model PA-31-310, powered by two 230kW turbo-charged Lycoming TIO-540-A1A engines, entered production in 1967. The model PA-31 was developed further and in 1966 development of Piper's first pressurized aircraft, the PA-31P Pressurized Navajo started. The PA-31P was powered by 425 hp Lycoming TIGO-541-E engines and compared to earlier models had a longer nose, fewer and smaller windows, 95 l fuel tanks in the engine nacelles and a one-piece airstair cabin entry door instead of the split pair of doors on the unpressurized models. The PA-31P was certified in 1969. The Piper PA-31T Cheyenne is a turboprop development of the PA-31P Pressurized Navajo. The development of the Cheyenne goes in the mid 1960s when Piper made a decision to redesign the 'Navajo' to use turbines instead of piston engines. The resulting PA-31T Cheyenne was introduced in 1974. Originally, the aircraft was an upgraded version of the PA-31P Pressurised Navajo equipped with two Pratt & Whitney Canada PT6A-28 turboprop engines. The aircraft was further refined and developed, including aerodynamic improvements and fuselage extensions into Cheyenne I, II, IIXL and PA-42 Cheyenne III and IV. Deliveries of the PA-31T Cheyenne began in 1974. Production ended in 1985. The 1981-built Piper PA-31T2 Cheyenne IIXL c/n 31T-8166047 was registered N821SW in the USA. In January 1988, the Piper PA-31T2 was re-registered N457SR. On 24 July 1992, registration N457SR was cancelled as exported to Mexico. In Mexico, the Cheyenne IIXL was registered XB-FSG with Grupo Fralvar de Mexico SA de CV. At the end of 2009, GEOCART in Herten, Germany, bought the aircraft. The Piper PA-31T2 Cheyenne IIXL was completely overhauld, including the PT-6 turbo engines and fitted with a UltraCamX. 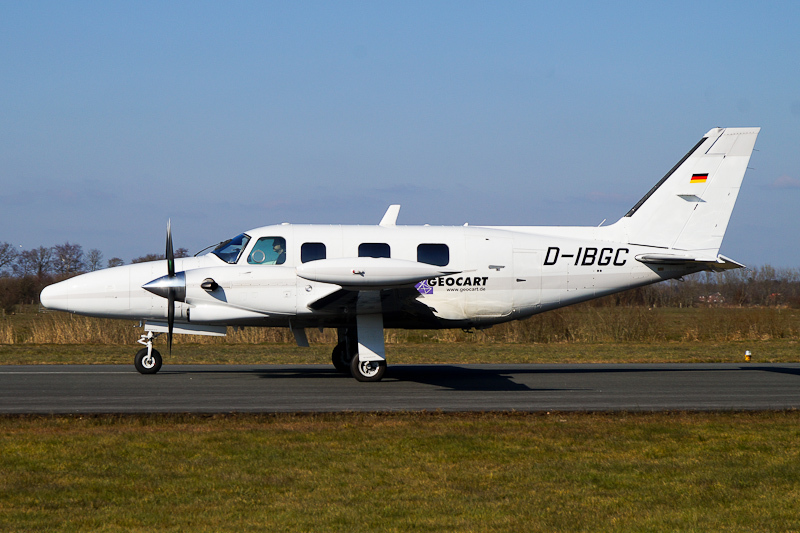 In May 2010, the Piper PA-31T2 Cheyenne IIXL was registered D-IBGC in Germany. In January 2016, the 3-blad propellers were replaced by 5-blade propellers that reduce noise emissions significantly. On 16 March 2016, the Piper PA-31T2 Cheyenne IIXL D-IBGC was seen at Flugplatz Leer-Papenburg.